The Bengali New Year is an occasion for Bengalis from all walks of life to celebrate their culture. Our culture is distinct, and its components have emanated from rural Bangla, where the roots of our identity truly lie. As we walk the increasingly one-way-road toward modernisation and westernisation, the importance of this day cannot be overstated. This day is about reconnecting with our identity, found hidden in the many arts and crafts of our culture. Such was the scope of Transcom Foods Ltd's “Boishakh Utshob”, a day-long festival held at the premises of their Gulshan-1 showroom. The festivities began at twelve noon on the auspicious day, and continued till eight in the evening, by which time the thirst for Boishakhi festivity of all present had been thoroughly quenched. Walking into the premises, one was greeted with an array of colours that brought out the flavour of the season. Stalls lined the inner perimeter of the plot, offering traditional art pieces such as 'alpana', 'matir putul', brightly embroidered hand fans, traditional toys and of course, t-shirts and shirts in the colours of Boishakh. The food stalls featured local snack favourites such as 'phuchka', 'chotpoti', 'chaat' and the quintessential fair item: candy floss. Visitors to the fair enjoyed these attractions while being entertained by Bangla folk songs emanating from the speakers. 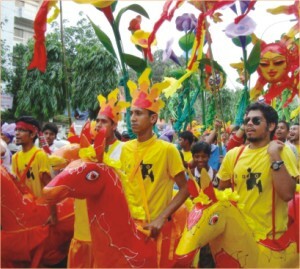 At four in the evening, a parade in full regalia began from the showroom premises, circling back from Gulshan-1 intersection via Shooting Club. The rally added more colour and gaiety to the day. Following the rally, the organisers hosted a 'Baul Gaaner Ashor' (Session of baul music) at the showroom's premises. This seemed to be the high point of the day for the assembled audience, putting the icing on the cake of a very traditional, and heart-warming event.